It is the soul of an electronic cigarette, without which the cigarette cannot function. The juice fuels the cigarettes. The liquid contains nicotine, flavouring agents and the vapour which when inhaled provides the throat drag similar to that of the conventional cigarette. However, not all of them contain nicotine. 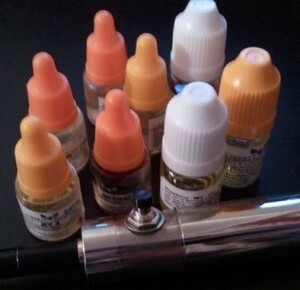 Some E-Liquids can also be nicotine free, while those that have nicotine mixed in them are available in varying strengths. It consist of two main base ingredients, namely PG (Propylene Glycol) and VG (Vegetable Glycerin). These can be used independent of each other or in combination. The base ingredients are combined with different natural or artificial flavours to provide the delectable, smooth flavour that Electronic Cigarettes are known for. With the vast variety available, there is no dearth of flavours to choose from. The flavour range includes a range of fruits such as oranges, muskmelon, watermelon, cherries, strawberries, and mangoes. There are wines and whiskey flavours too, including champagne and brandy. You also have a choice of bubble gum, menthol and mint. If you prefer the taste of chocolate or coffee, you have E-juice in those flavours as well. Propylene Glycol and Vegetable Glycerin used in juice are non-toxic in nature. The two ingredients are also FDA approved and are being used extensively in edible and pharmaceutical products. Propylene Glycol is used as an active ingredient in food colouring agents and as a flavour carrier in packaged foods. It is also used by pharmaceutical companies as a preservative and stabilizer in medicines. Vegetable Glycerin on the other hand is a vegetable-derived fluid with a sweet taste and very thick consistency. When it is used in combination with Propylene Glycol, it provides a smooth blend that vaporizes easily and offers a fine vaping experience.